Marsh has been living in a fog ever since the car crash that killed his twin brother and left him injured. He is being crushed by his sadness and guilt over what happened and what's happened since. He no longer cares about his friends at school or life in general... all he cares about is finding a Thin Space and making things right. You see when his elderly neighbor told him about these Thin Spaces- a place where the dead and living can meet-, and that she was going to make one, he thought she was just a nut. But now he's counting on it. Maddie has moved in to the house that has the best potential for holding a Thin Space. Marsh knows if he can only get close to her, she might let him in to find it. Even with all his craziness, Maddie wants to befriend Marsh. Even though her brother and his new friends are expressly against it. As the two of them become closer and bond over their need to find a Thin Space, Marsh gets closer to coming to grips with what really happened the night Austin died. I loved the idea that drove this book. What if there was a place where you could communicate with a dead loved one? And I can see how someone who is grieving can become completely obsessed with trying to make it happen. Marsh wanted to find a Thin Space so badly that he walked around without shoes at all times. You know just in case he walked into a Thin Space inadvertently. The mere thought of that hurts my feet and grosses me out. But this boy was DESPERATE. It was hard for me to believe that Maddie would gravitate to Marsh. If I saw a dude walking around without shoes, I'd be like HELL NO. I give her credit for being so open minded. The downside of this book for me was that I figured out "the secret" pretty early on. There were a few clues that jumped out at me and I just knew. I'm not usually good at figuring things like that out, so I think maybe it should have been disguised a little better. The rest of the book was kind of ruined because after I guessed the secret I looked at Marsh in a completely different way. With that being said there was one thing that happened at the end that I did NOT see coming at all, so it wasn't all ruined. I think this is a great first book for this author. The writing was fab and kept me reading long past my bedtime. I just wished that the big reveal was more hidden and I didn't FEEL the grief and sadness the way I have with some other books. I mean the boy lost his TWIN and he was super depressed, but the feeling for me wasn't there. OVERALL: A strong debut from Jody Casella!! It's a book about a boy paralyzed by grief and guilt. 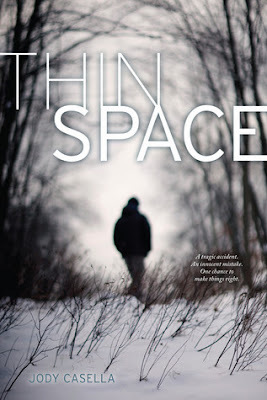 He's holding in secrets that he can't share with anyone and his quest to find a Thin Space takes over his life. I liked how the writing hooked me, but I wished I would have felt more. I usually cry like baby when a character hurts as much as Marsh was, but my face remained dry. I feel less encouraged to continue reading a book when I've figured out the big reveal early though it's interesting that he clings on this "Thin Space" and how that brings two people together.